Bring 1 litre of water to a boil.Add 1 tsp salt and chicken legs.Simmer for 20 mins.Cool.Shred meat from bone.Set aside. Cook prawns in same pan of water for 5 mins.Strain and reserve liquid.Shell prawns and set aside. Heat oil in wok over a medium fire.Add rempah and belacan ,cook until mixture smells fragrant and oil separates,about 3 mins. Add lemongrass and strained stock.Bring to a boil.Simmer 10 mins,then add coconut milk.Bring gravy to a boil while stirring.Season with salt and sugar,then add sliced tau pok. 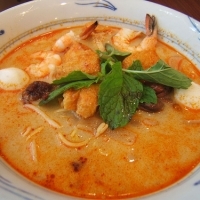 To serve,place blanched noodles and beansprouts in a bowl.Top with prawns and chicken.Pour hot laksa gravy over,including pieces of tau pok.Garnish with mint leaves and lime..
Like praggy's recipes? Never miss an upload!